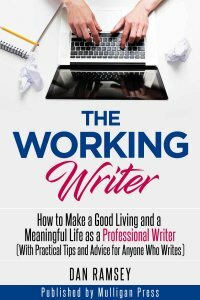 The Working Writer: How to Make a Good Living and a Meaningful Life as a Professional Writer (With Practical Tips and Advice for Anyone Who Writes) – Book 1 in the Working Writer Series published by Mulligan Press. How much do writers make? What writing skills are most important? What well-paying jobs are available for writers? How can you build a writing career from wherever you are to where you want to be? How can you write a book? Are there many writing jobs from home? How can you build a career in business writing? What are the secrets to making a good living and a meaningful life as a professional writer? Dan answers these and dozens of other vital questions with practical advice and examples from the vast world of commercial publishing. The Working Writer then explains how you can expand your writing skills with proven tips that will serve you well no matter what you write. You’ll see how to build a lucrative career as a staff writer or freelance writer sharing topics what you enjoy. You’ll discover the single element that all good writing has in common. You’ll discover how professional writers successfully tackle new writing assignments. Dan also shows you how to build a great author website, choose the best literary agent, win over writers’ block, and have fun as a pro writer. Clearly and concisely, Dan shares writing wisdom earned in a variety of fields. The world needs more Working Writers. You can be one of them! After 50+ years as a working writer, I wanted to share what I’ve learned with new writers toward helping them build a successful and rewarding career no matter what field they choose. Organized, outlined, enjoyable discovery with a practical purpose. Through many fascinating jobs that have paid me to write for others. Semi-retired from full-time freelance writing, I now publish websites and blogs in the mornings and take afternoons off for family and fun. Getting paid to learn and transfer useful knowledge is a rewarding and enjoyable life. Hundreds. Everything I read teaches me something about the craft and art of writing. I have written more than 100 published books and hundreds of other documents for money. I sincerely appreciate the efforts of the Nonfiction Authors Association and other professional groups that inspire new writers in career development.